Introduction Analgesia in breast surgeries can be delivered orally, intravenously, intramuscularly, neuroaxially, or using regional nerve blocks. Pectoral nerve block (Pecs) and serratus intercostal plane block (SIPB) are a recently introduced ultrasound-guided technique for providing intraoperative and postoperative analgesia. Aim The aim of the present study was to compare intraoperative and postoperative analgesic effect of Pecs versus SIPB in breast surgeries. Patients and methods The current study was carried out on 60 female patients of American Society of Anaesthesiologists class I or II. The patients were undergoing nonreconstructive breast surgery. The patients were randomly divided into two equal groups. The Pecs group included 30 patients who received ultrasound-guided Pecs with 40 ml of levobupivacaine with adrenaline 1 : 200 000. The SIPB group included 30 patients who received ultrasound-guided SIPB with 40 ml of levobupivacaine with adrenaline 1 : 200 000. After assessing the efficacy of the block using sensory block scale, standard general anesthesia was induced in both groups using intravenous fentanyl (1 µg/kg), propofol (2.5 mg/kg) and cisatracurium (0.15 mg/kg). Results The completion of block was significant shorter in SIPB group than Pecs group. The duration of paresthesia in the SIPB group extended to 8 h postoperatively, whereas in the Pecs group the duration extended to 3 h postoperatively. Visual analog scale at rest and in movement was significantly higher in the Pecs group compared with the SIPB group. The number of patients who received postoperative fentanyl was significantly increased in the Pecs group than in the SIPB group. The first request for postoperative fentanyl was significantly delayed in the SIPB group than in the Pecs group. There was no significant difference in the total dose of fentanyl consumption during 24 h postoperatively between the two groups. Conclusion The present study found that SIPB provided superior postoperative analgesia compared with Pecs in patients undergoing nonreconstructive breast surgeries. The patients who undergo breast surgeries experienced clinically meaningful postoperative pain . Postmastectomy pain is usually acute nociceptive pain; it occurs as normal response to noxious insult or injury , but some of the patients may also experience neuropathic pain (nerve damage pain) . Inadequately controlled pain negatively affects quality of life, functional recovery and increases the risk for postsurgical complications . Intravenous opioids are mainly administered for acute postmastectomy pain. Using opioid drugs solely may develop many side effects such as sedation, nausea, vomiting and respiratory depression . Thoracic epidural analgesia and paravertebral block become the gold standard techniques for breast surgery ,. However, both techniques may be associated with serious complications such as pneumothorax and total spinal anesthesia . After the application of ultrasound in anesthetic practice, several interfascial plane blocks have been described recently. Pectoral nerve blocks (Pecs) and serratus intercostals plane block (SIPB) are novel interfascial plane blocks, which can provide analgesia for breast surgeries . Blanco  initially described ultrasound-guided Pecs I block by placing local anesthetic into the plane between pectoralis minor and pectoralis major to target the medial pectoral nerve and the lateral pectoral nerve providing analgesia to the chest wall . Lately, he described ‘ultrasound-guided Pecs II’ block, another approach aiming to block the axilla and at least two lateral cutaneous branch of intercostal nerves, mainly T2–T4 that are necessary for axillary node dissection and wider excisions . SIPB was described by Fajardo  as a new ultrasound-guided technique. Local anesthetic was injected between serratus anterior and external intercostal muscles in the midaxillary line to block the lateral cutaneous branches of the intercostal nerves mainly from T2 to T9 before dividing into anterior and posterior branches. On injection of local anesthetic at this level it also blocks the long thoracic and thoracodorsal nerves . The aim of the present study was to compare intraoperative and postoperative analgesic effect of ultrasound-guided Pecs versus ultrasound-guided SIPB for breast surgeries. After the approval of the ethical committee of Alexandria Faculty of Medicine and Medical Research Institute and obtaining written informed consent from patients. The current study was carried out on 60 American Society of Anaesthesiologists class I or II female patients, who were undergoing nonreconstructive breast surgeries under general anesthesia. The patients were randomly divided into two equal groups using the closed envelope method. Patients with allergy to local anesthetics, reconstructive breast surgery, bilateral breast surgeries, liver dysfunction, coagulopathy, renal dysfunction, psychiatric disorder, pregnancy and morbid obesity (BMI: >40 kg/m2) were excluded. The present study was registered at the Cochrane Research Database of South Africa (PACTR201505001108423) (http://www.pactr.org). All patients were evaluated the day before surgery. All patients were trained to use visual analog scale (VAS) to express their pain. All patients received sedating dose of midazolam (0.05 mg/kg) before the block. All patients arrived to the block room 30 min before the operation. The blocks were performed after insertion of a 20 G peripheral venous catheter and attached to the multichannel monitor for each patient. Patients in the Pecs block group received a combination of Pecs I and Pecs II blocks. The patient was made to lie in supine position and a high-frequency linear probe (10 MHz) was covered with sterile sheath and used for scanning after disinfection of the skin. For Pecs I, the probe was positioned in the parasagittal plane below the lateral half of the clavicle. The pectoral branch of the thoracoacromial artery was identified between the two pectoralis muscles using color Doppler. In-plane needle approach was used and the needle was advanced from medial-to-lateral direction after infiltration of the skin at puncture site with 3 ml of xylocaine 2%. A volume of 10 ml of levobupivacaine 0.25% with adrenaline 1 : 200 000 (5 µg/ml) was injected between two pectoral muscles (the interpectoral plane) with careful intermittent aspiration to avoid intravascular injection ([Figure 1]). Figure 1 Ultrasound view of Pecs I (pec. major = pectoralis major muscle and pec. minor = pectoralis minor muscle). For Pecs II, the probe was placed caudal to the lateral third of the clavicle to locate the first rib. The probe was moved distally and caudally toward the axilla until the third rib was encountered. The potential space between the pectoralis minor and serratus anterior was identified. In-plane technique with the needle approach was used and the needle was advanced from medial-to-lateral direction. A volume of 30 ml of levobupivacaine 0.25% with adrenaline 1 : 200 000 (5 µg/ml) was injected between pectorals minor and serratus anterior at the third rib or fourth rib level after frequent careful aspiration to avoid intravascular injection ([Figure 2]). Figure 2 Ultrasound view of Pecs II (R3 = third rib and R4 = fourth rib). The patient was made to lie in supine position and a high-frequency linear probe (10 MHz) was covered with sterile sheath and used for the scanning. The probe was placed in the midaxillary line and then moved caudal from second rib until the sixth intercostal space. At this point, the subcutaneous tissue and serratus muscle were identified in the superficial plane, whereas the external intercostal muscles were identified in the intermediate plane and finally in the deep plane the ribs, pleura and lung were identified. The needle was advanced from caudal to cranial direction. In-plane technique was used until the tip of the needle placed between the serratus anterior muscle and the external intercostals muscle. A volume of 40 ml of levobupivacaine 0.25% with adrenaline 1 : 200 000 (5 µg/ml) was injected after aspiration to avoid intravascular injection ([Figure 3]). Figure 3 Ultrasound view of serratus intercostal plane block (EICM = external intercostal muscle and SA = serratus anterior muscle). After assessing the efficacy of the block using sensory block scale, standard general anesthesia was induced in both groups using intravenous fentanyl (1 µg/kg), propofol (2.5 mg/kg) and cisatracurium (0.15 mg/kg) to facilitate endotracheal intubation. Anesthesia was maintained with isoflurane (1–1.5%) with oxygen–air mixture. Ventilation was maintained by given a tidal volume 6–8 ml/kg until the end of the surgery and the rate of end tidal carbon dioxide was adjusted to 35–45 mmHg in the ventilator (Fabius GS; Drager, Berlin, Germany). Incremental doses of cisatracurium 0.03 mg/kg were given until the end of the surgery, monitored with (TOF-Watch S Neuromuscular Monitor-SKU: B170200, Bell Medical, Saint Louis, USA) watch to maintain one twitch response. Incremental doses of fentanyl (25 μg) was given when the heart rate was more than 110 (beats/min) and/or mean arterial blood pressure more than 20% from the baseline. At the end of surgery, anesthesia was discontinued and residual neuromuscular block was antagonized by atropine (0.01 mg/kg) and neostigmine (0.04 mg/kg) at the appearance of second twitch of TOF guided by TOF watch acceleromyography. Thereafter, the trachea was extubated after suction. The consciousness level, hemodynamics such as heart rate (beats/min), mean arterial blood pressure (mmHg) and respiratory rate were observed until each patient was fully recovered. All patients received ketorolac 30 mg every 8 h. It started immediately postoperatively in the postanesthetic care unit. Age and weight of the patients were recorded. The ease of the block was measured with time to visualize needle into the target plane and real time of observation to the spread of local anesthetic. The sensory block was judged by the cold sensation using an ice pack from T1 to T10 at three points in each dermatome (parasternal, midclavicular and midaxillary). Preoperative sensory block scale (1-no loss of sensation, 2-partial loss of sensation and 3-complete loss of sensation) was applied every 5 min for 20 min. Postoperatively, the assessment was carried out every hour in the first 12 h, and then every 4 h thereafter for 24 h.
Motor examination was carried out using crossed arm adduction movement examination. The Medical Research Council scale was used for examination of arm adduction muscle power (0=no muscle contraction is visible, 1=muscle contraction is visible but there is no movement of the joint, 2=active joint movement is possible with gravity eliminated, 3=movement can overcome gravity but not against resistance, 4=the muscle group can overcome gravity and move against some resistance and 5=full and normal power against resistance). Preoperatively, the Medical Research Council was examined after blocks at 5 min and postoperatively every hour during the first 12 h, and then every 4 h thereafter for 24 h.
Heart rate (beats/min), oxygen saturation (SpO2%) and mean arterial blood pressure (mmHg) were recorded before blocks and then they were recorded at induction of anesthesia, and then every 10 min intraoperatively. Heart rate (beats/min) and mean arterial blood pressure (mmHg) were measured upon arrival to the postanesthetic care unit and after 30 min and then every hour during the first 12 h and then every 4 h thereafter for 24 h.
Total dose of fentanyl intraoperatively and duration of operation were recorded. The VAS was used at rest and on movement for assessment of pain intensity at the arrival to the postanesthetic care unit and after 30 min. In the surgical ward, pain intensity was assessed every hour during the first 12 h and then every 4 h thereafter for 24 h postoperatively. The first time of analgesia requirement (25 μg fentanyl) was recorded (when VAS was >3 and or when heart rate was >110 beats/min and or mean arterial blood pressure was >20% from the baseline) and also total amount of fentanyl consumed in 24 h was recorded. Patient satisfaction was recorded using verbal rating scale for satisfaction after 24 h from block (1=very dissatisfied, 2=dissatisfied, 3=neutral, 4=satisfied and 5=very satisfied). Postoperative complications were recorded. Data were collected and entered to the computer using statistical package for the social science program for statistical analysis (SPSS, version 21; SPSS Inc., Chicago, Illinois, USA). Data were entered as numerical or categorical, as appropriate. When the Kolmogorov–Smirnov test revealed no significance in the distribution of variables, parametric statistics were carried out, whereas in the non-normally distributed data the nonparametric statistics were carried out. Exploration of the data: this yielded complete descriptive statistics, including the minimum and maximum, range, mean, SD, 95% confidence interval of the mean median and interquartile range for each variable. Data were described using minimum, maximum, mean and SD for the normally distributed data. Data were described using minimum, maximum, median and interquartile range for non-normally distributed data. Comparisons were made between the two studied groups using independent t-test or the Mann–Whitney test. Repeated-measures analysis of variance was carried out within group for the normally distributed variables. The Friedman test was carried out for repeated measures for the non-normally distributed variables. Box and Whiskers and error-bar graphs were used. The χ2-test and the Fisher exact test were used to measure association between qualitative variables. Monte Carlo correction and Fisher’s exact correction were carried out when indicated (expected cells <5). Correction of P value for multiple testing was set to 0.003 to detect significance (Bonferroni correction of multiple comparisons) . Therefore, in the present study, α level was set to 0.3% with a significance level of 99.7% and a β error accepted up to 20% with a power of study of 80%. No significance was recorded as regards the demographic data and surgery duration ([Table 1]). As regards the ease of the block, time to see needle in the desire plane was significantly shorter in the SIPB group than in the Pecs group (t(df=58)=10.109, P=0.000) and time to observe spread of local anesthetic in the desire plane was significantly shorter in the SIPB group than in the Pecs group (t(df=58)=14.961, P=0.000) ([Table 2]). The dermatomal level of paresthesia in the SIPB group was T1–T8, T1–T10, and T2–T8 in 20% patients, whereas in the Pecs group it was T2–T4 in 46.7% patients. As regards the sensory assessment, there was no significant difference between the two groups. The duration of paresthesia in SIPB extended to 8 h postoperatively, whereas in the Pecs group the duration extended to 3 h postoperatively. As regards motor assessment, there was no significant difference between the two groups. As regards oxygen saturation intraoperatively, heart rate (beats/min) intraoperatively and postoperatively, and mean arterial blood pressure (mmHg) intraoperatively and postoperatively, there was no significant difference. As regards the number of patients who consumed intraoperative fentanyl, there was no significant difference. 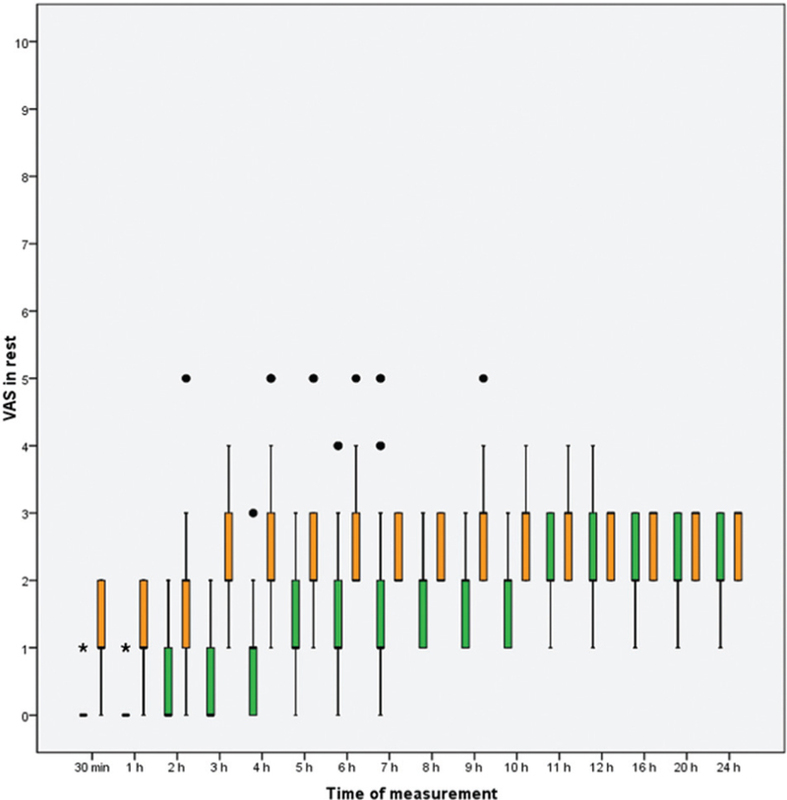 It found that VAS at rest was significantly higher in the Pecs group than in the SIPB group at all measured time except at 12 h postoperatively. The VAS in movement was significantly higher in the Pecs group than in the SIPB group at post anesthesia care unit (PCAU) and 30 min, 1, 2, 3, 4, 5, and 6 h postoperatively ([Figure 4] and [Figure 5]). Figure 4 Box and whisker graph represents VAS at rest in the two studied groups, the thick line of the box represents the median, the box represents the inter-quarter range (from 25th to 75th percentiles), the whiskers represents the minimum and maximum after excluding the outliers (black filled circles) and extremes (black asterisks) (Orange colored box = Pecs group and green colored box = SIPB group). Figure 5 Box and whisker graph represents VAS in movement in the two studied groups, the thick line of the box represents the median, the box represents the inter-quarter range (from 25th to 75th percentiles), the whiskers represents the minimum and maximum after excluding the outliers (black filled circles) and extremes (black asterisks) (Orange colored box = Pecs group and green colored box = SIPB group). When comparing the results of both groups in the number of patients who received postoperative fentanyl, there was a significant increase in the number of patients in the Pecs group than in the SIPB group ([Table 3]). It was found that the first request for fentanyl ([Figure 6]) was significantly delayed in the SIPB group than in the Pecs group; it was after 6.33±1.211 in the SIPB group, whereas it was after 4.00±1.300 in the Pecs group. On comparing the total dose of fentanyl consumption during 24 h postoperatively between the two groups, there was no significant difference. There was no significant difference between the two groups in patient satisfaction verbal rating scale. There were no detected complications. Figure 6 Box and whisker graph represents time of first dose of fentanyl (hours) in the two studied groups, the thick line of the box represents the median, the box represents the inter-quarter range (from 25th to 75th percentiles), the whiskers represents the minimum and maximum after excluding the outliers (black filled circles). The Pecs group was significant earlier than SIPB group. In the present study, the time to see the needle and time to observe the spread of local anesthetic in the desired plane was significantly longer in the Pecs group. This was attributed to double puncture in the Pecs group, whereas in the SIPB group it was only one puncture. In agreement with the present study, Blanco et al. conducted a study evaluating serratus plane block and stated that SIPB is a progression from Pecs I and II. The technique became easier in application in that in SIPB there was no requirement for multiple needle insertion points and the needle orientation changed because the serratus plane is more superficial and easier to identify. In the present study, dermatomal level of the sensory block in the Pecs group was T2–T4 in 46.7% of patients, whereas in the SIPB group it was T1–T8, T2–T8, and T1–T10 in 20% of the patients. In agreement with the present study, Blanco et al. conducted a study describing Pecs II and showed that Pecs blocked T2–T4 dermatomes with variable spread to T6 using 10 ml levobupivacaine 0.25% between the pectoral muscles (Pecs I) and 20 ml under pectoralis minor and above the serratus muscle (Pecs II). Moreover, another study by Blanco et al. demonstrated that the area of sensory loss and spread of the injection deep to the serratus muscle using magnetic resonance was from T2 to T9 with axillary spread. The onset of sensory block in both groups was started after 5 min and maximum degree of sensory block was recorded after 20 min in both groups. The duration of sensory block in the SIPB group extended up to 8 h (480 min), whereas it extended up to 3 h (180 min) in the Pecs group postoperatively. In agreement with the present study, Fajardo , who conducted a study evaluating SIPB for breast surgery, stated that the duration of the sensory loss was relatively higher in the SIPB group than in the Pecs II group using levobupivacaine 0.125%. On the contrary, Blanco et al. demonstrated that, after 30 min of the injection, the mean duration of paresthesia involving the intercostal nerves was 386 min after injection of 0.4 ml/kg levobupivacaine (0.125%) deep to serratus anterior, whereas it was 752 min after injecting the same dose superficially to the muscle. This may be attributed to using different dose and concentration of local anesthetic in the study by Blanco. Moreover, the study was conducted upon 4 volunteers only, and hence there was no clinical data to support these results . In the present study, on motor assessment with crossed arm adduction, there was no significant difference between the two groups. There were only two patients who complained of weak crossed arm adduction in the SIPB group, which resolved after 3 h. In contrast to the present study, Guzzetti et al. , who conducted observational analysis study about novel chest wall blocks (Pecs and SIPB) during breast surgery, stated that three cases that received Pecs II block had a weak cross-arm adduction with a spontaneous resolution after 6 h. It may be attributed to the fact that some of the patients in the study by Guzzetti received Pecs block using mepivacaine 2% for anesthesia, whereas in the present study all patients received Pecs using levobupivacaine (0.25%) for analgesia. As regards oxygen saturation (SpO2%), heart rate (beats/min) and mean arterial blood pressure (mmHg), there were no significant differences. In agreement with the present study, Blanco et al. showed that Pecs blocks (types I and II) are peripheral approaches that combine both motor and sensory nerve blocks and there was no sympathetic block. Moreover, Bashandy et al. , who conducted a study evaluating Pectoral nerve I and II blocks (Pecs I and Pecs II) in multimodal analgesia for breast cancer surgery, stated that the Pecs block is a combination of motor and sensory nerve blocks. One of the advantages of Pecs block is that it is not associated with sympathetic block as epidural and thoracic paravertebral blocks. The present study did not show significant difference as regards the number of patients who consumed intraoperative fentanyl between two groups. In the Pecs group, there were six (20%) patients and in the SIPB group there were three (10%) patients who required intraoperative fentanyl. 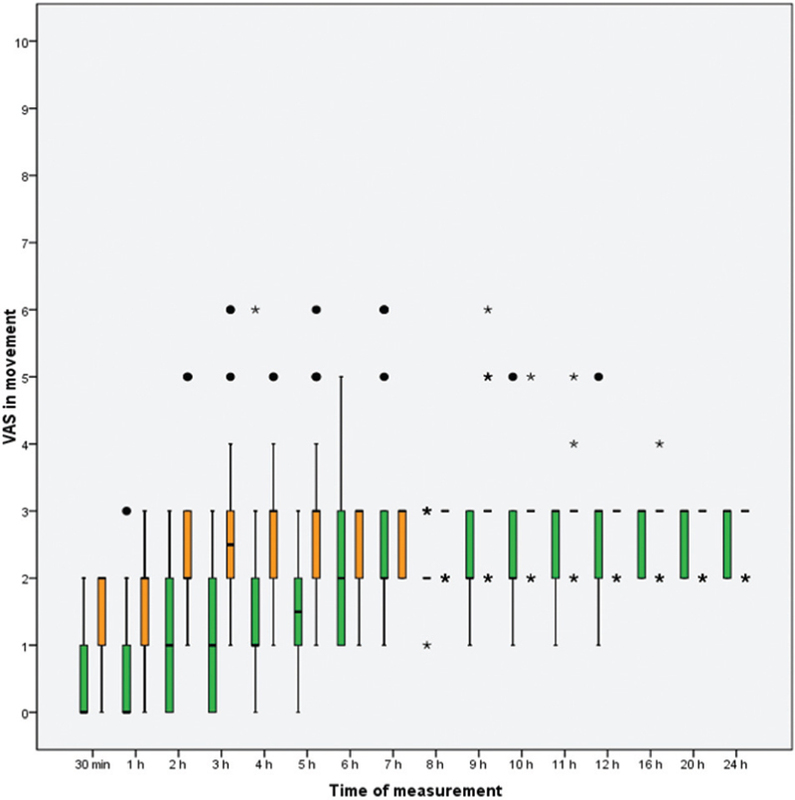 The dose did not exceed 25 µg for each patient who received intraoperative fentanyl. In contrast to the present study, Wahba et al. , who conducted a study comparing thoracic paravertebral versus Pec for analgesia after breast surgery, showed that intraoperative fentanyl consumption was significantly lower in the Pecs group than in the paravertebral group and total dose of fentanyl was 105±5 µg. However, in the present study, total dose of fentanyl in the Pecs group was 150 µg. Diéguez et al. , who conducted a study about BRILMA, stated that, of 100 patients who received BRILMA, only four required intraoperative fentanyl after incision. In the present study, pain intensity was assessed using VAS at rest and in movement. VAS at rest was significantly higher in the Pecs group than in the SIPB group except at 12th hour postoperatively. VAS in movement was significantly higher in the Pecs group than in the SIPB during the first 10th hour postoperatively. It may be attributed to the fact that the dose of local anesthetic in the Pecs group was divided into two planes, whereas in the SIPB group all doses of local anesthetic were injected in the same plane. As regards the first time of postoperative fentanyl requirement, it was significantly earlier in the Pecs group than in the SIPB group. Only six of 30 patients had moderate pain in the SIPB group, whereas 14 of 30 patients had moderate pain in the Pecs group. The number of patients who consumed fentanyl postoperatively was significantly higher in the Pecs group than in the SIPB group. Total doses of fentanyl consumption in 24 h showed no significant difference between the two groups. In agreement with the present study, Hards et al. , who conducted a study about the effect of serratus plane block performed under direct vision on postoperative pain in breast surgery, stated that there was excellent pain control; 81% of patients who had received SIPB under direct vision experienced mild pain or no pain compared with the control group. The pain scores for serratus plane block patients were marginally better compared with the pain scores for controls. None of the patients receiving SIPB suffered from severe pain after mastectomy, whereas in the control group three (27%) patients reported severe pain after their operation. In agreement with the present study, Nair et al. , who conducted a study on ultrasound-guided blocks for surgical procedures involving chest wall (Pecs 1, Pecs 2, and serratus plane block), stated that these blocks provided good analgesia for procedures involving anterior and anterolateral chest wall. Nair concluded that all three blocks are extremely helpful in day-care procedures in which thoracic epidural is not feasible. Contrary to the present study, de la Torre et al. stated that 32 of 35 patients of the SIPB group reported VAS of 0. None of the patients in this group needed a rescue remifentanyl bolus intraoperatively or morphine in the PACU. In the present study 18 of 30 patients needed postoperative fentanyl and only 6 patients had VAS of 0 in SIPB group. It may be attributed to the study by de la Torre et al., who conducted only on axillary surgeries without mastectomy. In the present study, there was no significant difference between the two groups as regards patient satisfaction. Totally, 22 (73.3%) patients were very satisfied in the SIPB group, whereas 17 (56.7%) patients in the Pecs group were very satisfied, which was attributed to double puncture in the Pecs group. De la Torre et al. stated that 32 of 35 patients in the SIPB group classified the anesthesia technique used as excellent and two of 35 as good. Moreover, D’Mello et al. showed that the Pecs block can be used effectively in day case breast surgeries, thus improving patient satisfaction. There was no complication recorded in the present study in both groups. In agreement with the present study, de la Torre et al. stated that long thoracic nerve palsy was not recorded in both approaches (SIPB and Pecs). Bashandy et al. conducted a study and stated that complications should be easily avoided with proper ultrasound training and searching for the right pattern of spread of the local anesthetic. The Pecs and SIPB blocks produce excellent analgesia when combined with general anesthesia for breast surgeries with or without axillary dissection. They are simple, easy-to-learn techniques, having easily identifiable landmarks based on good anatomical and ultrasound knowledge, making them an excellent alternative to the conventional thoracic paravertebral and neuroaxial blocks for breast surgeries. The present study found that the SIPB group provided superior postoperative analgesia compared with the Pecs group in patients undergoing nonreconstructive breast surgeries. Katz J, Poleshuck EL, Andrus CH, Hogan LA, Jung BF, Kulick DI et al. Risk factors for acute pain and its persistence following breast cancer surgery. Pain 2005; 119:16–25. Dworkin RH, Jensen MP, Gammaitoni AR, Olaleye DO, Galer BS. Symptom profiles differ in patients with neuropathic versus non-neuropathic pain. J Pain 2007; 8:118–126. Gray P. Acute neuropathic pain: diagnosis and treatment. Curr Opin Anesthesiol 2008; 21:590–595. Wikler A. Opioid dependence: mechanisms and treatment. New York: Springer Science & Business Media; 2013. Lynch EP, Welch KJ, Carabuena JM, Eberlein TJ. Thoracic epidural anesthesia improves outcome after breast surgery. Ann Surg 1995; 222:663. Kooij FO, Schlack WS, Preckel B, Hollmann MW. Does regional analgesia for major surgery improve outcome? Focus on epidural analgesia. Anesth Analg 2014; 119:740–744. Wahba SS, Kamal SM. Thoracic paravertebral block versus pectoral nerve block for analgesia after breast surgery. Egypt J Anaesth 2014; 30:129–135. Blanco R. The ‘pecs block’: a novel technique for providing analgesia after breast surgery. Anaesthesia 2011; 66:847–848. Nair AS, Sahoo RK, Ganapathy M, Mudunuri R. Ultrasound guided blocks for surgeries/procedures involving chest wall (Pecs 1, 2 and serratus plane block). Anaesth Pain Intensive Care 2015; 19:348–351. Guzzetti L, Danelli G, Ricci EB, Torrano V, Russo G, Fusco P et al. An observational analysis about novel chest wall blocks (PECS and SERRATUS) during breast surgery. Austin J Surg 2016; 3:1083. Bashandy GMN, Abbas DN. Pectoral nerves I and II blocks in multimodal analgesia for breast cancer surgery: a randomized clinical trial. Reg Anest Pain Med 2015; 40:68–74. Diéguez P, Fajardo M, López S, Alfaro P. BRILMA methylene blue in cadavers. Anatomical dissection. Revista española de anestesiología y reanimación 2016; 63:307. Hards M, Harada A, Neville I, Harwell S, Babar M, Ravalia A et al. The effect of serratus plane block performed under direct vision on postoperative pain in breast surgery. J Clin Anesth 2016; 34:427–431. de la Torre PA, Jones JW, Álvarez SL, Garcia PD, de Miguel FJG, Rubio EMM et al. Axillary local anesthetic spread after the thoracic interfacial ultrasound block − a cadaveric and radiological evaluation [Online]. Braz J Anesthesiol 2016; http://dx.doi.org/10.1016/j.bjane.2015.04.007. D’Mello O, Nallapillai A. PECS block: a novel technique to provide a day case breast surgery service. Canada: Ultrasound for Regional Anesthesia; 2016.